Search.searchlttrnpop.com is the PUP that uses misleading techniques to prevent removal. Use Reimage to locate malicious components and get rid of them faster than with uninstall instructions. A full system scan blocks virus reappearance and prevents traffic to malicious domains. Search.searchlttrnpop.com deems to be a legitimate search engine which allows users to listen to the music directly from their browser. However, this questionable app is nothing but a browser hijacker which invades victims’ machines without permission and makes unwanted changes to each of the possessed browsers. Listen To The Radio Now is another application created by Polarity Technologies Ltd. Just as Search.searchyrs.com, it promotes multiple music platforms (for example Spotify, SoundCloud, Youtube) and other social media websites. Additionally, clock, weather, and news links are added. According to developers, it is all done for the convenience of the user. However, do not get fooled by all this “advanced functionality and enhanced search results.” These are merely promises which are entirely bogus, and usage of such suspicious app will bring more trouble than benefit. Thus, check out the adverse effects of a hijack and learn how to remove Search.searchlttrnpop.com swiftly by reading this article. websites load much slower, etc. The modified browser settings are impossible to reverts you are forced to browse through a hijacked search engine. The only way to go back to your regular search engine and the homepage is by eliminating Listen To The Radio Now. Ads and pop-ups might be injected directly into legitimate websites which may cover the background content. This layer of ads indeed decreases browsing experience. Additionally, some text might be turned into hyperlinks which lead to sponsors’ websites. Developers of Search.searchlttrnpop.com generate pay-per-click revenue this way. Redirects threaten safe computer operation by directing the victim to potentially dangerous websites where malware may be obtained. Such perilous threats like ransomware might destroy your personal and system files permanently. Spyware might record your every keystroke and get your credentials – this information can be used for illegal purposes by cybercriminals. We hope that this information has convinced you that using a hijacked browser is not safe after all. Thus, arm yourself with a security tool like Reimage and proceed with Search.searchlttrnpop.com removal. Alternatively, you can try manual elimination by checking our step-by-step guide below. Although Listen To The Radio Now can be downloaded officially in Google, Mozilla or other web stores, researchers noted, that in most cases, it invades users’ machines with bundled software. This practice is prevalent amongst PUP and free software developers. Hence, if you are downloading programs like PDF creators, media players, free online games, optimization tools, etc., make sure you install them correctly and avoid suspicious applications you do not need. As we already mentioned, all the added functionality offered by developers is bogus and should not be trusted. You can just as easily create your own quick access buttons via Favorites/Bookmarks bar. 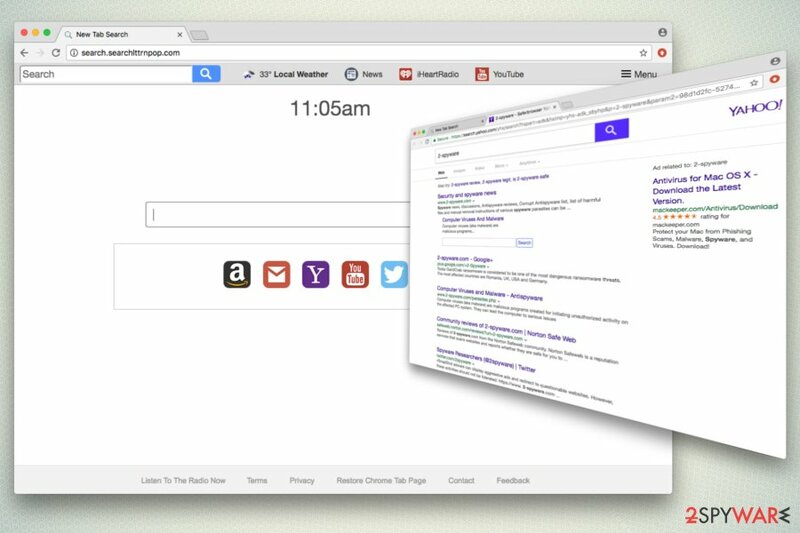 There is no need to use a browser extension which manipulates your search results. Luckily, you can remove Listen To The Radio Now in just a few simple steps. You can do it either manually or automatically. If you prefer a quick and effortless Search.searchlttrnpop.com removal, we advise you to download and install a robust anti-spyware application and bring it to the latest version. The full computer scan can ensure complete elimination of the virus. Additionally, other unknown apps can be deleted just as easily. You can also remove the debatable application by checking our detailed instructions below. Beware that incorrect execution will lead to reinfection of the virus. Additionally, we do not recommend this method for anybody who is new to computers. Here, look for Search.searchlttrnpop.com or any other recently installed suspicious programs. Wait until you see Applications folder and look for Search.searchlttrnpop.com or any other suspicious programs on it. Now right click on every of such entries and select Move to Trash. When in the new window, check Delete personal settings and select Reset again to complete Search.searchlttrnpop.com removal. Once these steps are finished, Search.searchlttrnpop.com should be removed from your Microsoft Edge browser. Here, select Search.searchlttrnpop.com and other questionable plugins. Click Remove to delete these entries. Now you will see Reset Firefox to its default state message with Reset Firefox button. 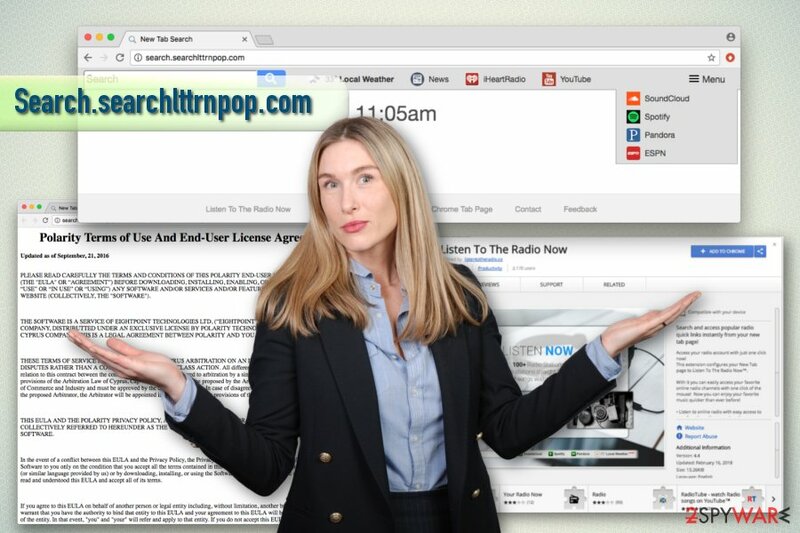 Click this button for several times and complete Search.searchlttrnpop.com removal. Here, select Search.searchlttrnpop.com and other malicious plugins and select trash icon to delete these entries. Click Reset to confirm this action and complete Search.searchlttrnpop.com removal. Here, select Extensions and look for Search.searchlttrnpop.com or other suspicious entries. Click on the Uninstall button to get rid each of them. Here, look at the Homepage field. If it was altered by Search.searchlttrnpop.com, remove unwanted link and enter the one that you want to use for your searches. Remember to include the "http://" before typing in the address of the page. Now you will see a detailed dialog window filled with reset options. All of those options are usually checked, but you can specify which of them you want to reset. Click the Reset button to complete Search.searchlttrnpop.com removal process. ^ Margaret Rouse. Pop-up ad. Whatis. IT Definitions. ^ What is spyware?. BBC’s WebWise. Making the most of being online. ^ Wubingdu. Chinese IT researchers. This entry was posted on 2018-03-14 at 04:38 and is filed under Stealing programs, Viruses. You can quickly scan the QR code with your mobile device and have Search.searchlttrnpop.com manual removal instructions right in your pocket. How did you remove Search.searchlttrnpop.com?